Here is the real Mike Wazowski. 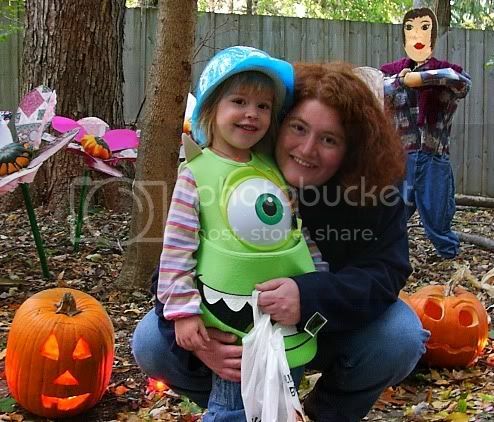 However, not too far from where I live, another Mike Wazowski made an appearance this weekend. 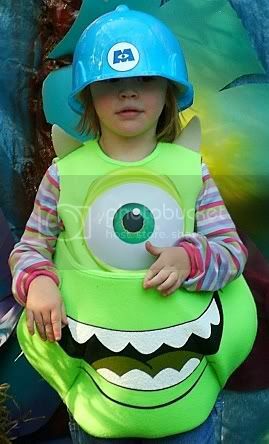 Ours was the only Mike Wazowski we saw at the trick-or-treating event. Brooke and I did see a small Sully, but he and Mike never did get together. Mike just mostly hung out with Mom. i don't remember mike being so utterly cute! Nice picture! Again, I feel like living in woods and having no connection with the normal world... I say that because I live in Romania and I know a kid that would LOVE such a costume but... there is no point in trying to find it here. Could you give me an idea? Where did you get it from? Do they have an E-mail address or something? Please, let me know! My E-mail is goopy_more@yahoo.co.uk. Thanks! r.
My little man is ten inches long!